WE ARE EXTENDING THE DEADLINE FOR THE CONTEST TO JANUARY 8TH, 2014. Entries can be posted on your blog any time between now and 11:59PM EST on the 8th. Winners will be announced on January 12th. Questions about the contest? Contact us at trueclassicsblog (at) gmail dot com. It’s our fourth blog anniversary! On November 30, 2009, we kicked off The ABCs of Classic Film, which would soon morph into True Classics. It’s been a busy and fruitful four years, and we remain ever grateful to be able to share our love of classic movies with all of you. For the past couple of years, we’ve celebrated our anniversary with a big contest, giving away fantastic prizes to some very deserving winners among our awesome readers. But this year has been so busy, we thought perhaps we’d take a break from contests and just acknowledge the day and move on without further comment. And we promise, this year you won’t have to write a limerick to win. So what do you have to do this time around, you might ask? 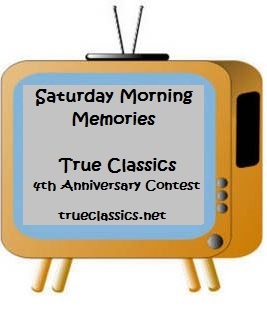 For this year’s anniversary contest, we decided to combine two of our favorite ongoing series here at True Classics–Saturday Morning Cartoons and our annual Movie Memories event–to bring you … Saturday Morning Memories. The rules are simple: on your own site, post a brief piece about one beloved cartoon short that you remember from childhood. If you can find a video and embed it on your site, that’s wonderful; if it’s so obscure that no video clip exists, no worries. But here’s the important part: tell us why that cartoon is particularly memorable to you. Are you a Popeye patron? A Droopy devotee? A Bugs booster? A Woody Woodpecker worshiper? A Fudd fan? A Donald disciple? (Stop me; I could go on all day.) Simply put: what is a favorite cartoon from your youth, and why? We’re not asking for in-depth essays here–just your fond recollections of a childhood favorite (of course, you are free to write as much as you wish). There are no date restrictions, either–whether the cartoon in question was produced in 1913 or 1993, as long as it’s one of your favorites, and truly memorable for you, it qualifies! We will be accepting entries between now and December 18th. You can post your piece at any time between those dates on your own site. Once you’ve posted, return to this page and leave a comment with a link to your piece. The four True Classics crew members will judge the entries and announce the winners on December 22nd. What are we looking for with these pieces? The judging criteria is simple: we’re going to love whatever entertains us the most! So be enthusiastic, witty, sarcastic, creative. Tell us some little-known trivia about your favorite cartoon. Share an anecdote about your choice that links it to a particular moment or memory from your childhood. The sky’s the limit! And now the most important part of all: the prizes up for grabs! This year, we’re offering our winners the chance to choose their own awards in the form of gift cards! Our first-place winner will receive their choice of a $75 gift card to either the TCM Shop, Amazon, or Barnes & Noble! Our second-place winner will receive their choice of a $25 gift card to either the TCM Shop, Amazon, or Barnes & Noble! Our third-place winner will receive their choice of a $10 gift card to either Amazon or Barnes & Noble! Contest is only open to residents of the United States and Canada. The contest will end at 11:59PM EST on Wednesday, December 18th, and all entries must be posted before then in order to qualify. You must leave a comment on this post or email us a link to your contest entry BEFORE the deadline in order for it to count. The winners will be contacted by email on Sunday, December 22nd and will have 48 hours to respond and claim their prizes. If any of the winners do not respond within the designated time period, another winner will be chosen. If you have any questions about the contest or your eligibility to enter, please contact us at trueclassicsblog (at) gmail (dot) com. We can’t wait to see all of your sure-to-be-wonderful posts! As we embark upon another year of blogging, dear readers, we thank you with all our hearts for your support of True Classics over the past four years, and hope we can continue to entertain you during the next four and beyond! Happy blogaversary! Here’s to many more successful years! Happy 4th Blogaversary! I always enjoy reading your blog – it’s tops in my book! Happy 4th to you Brandie, and a very Merry Christmas to you and your faithful readers. I would like to thank you for all your superlative writing over the past several years at this place and at WitD, where you wrote some outstanding genre essays. The best always. I’ll certainly do my best to identify and post on a favorite cartoon. True Classics is a staple for all of us movie-lovin’ folks. I’ve been away for a while, but I’m back at it and happy for that. I’ve missed your wonderful stuff and look forward to more! I may take a stab at the contest if I can … what prizes! Have a Happy New Year! I totally forgot about this. Thanks for the reminder. Brandie & Company, congratulations on your 4th Anniversary! It couldn’t happen to a niftier quartet of fabulous bloggers! If I’m not already too late, I’d love to contribute; it’s just a matter of what it’ll be! Are you going to post a master list on the blog so we can all check out each other’s postings? That’d be great! Yes, we will post one tomorrow as soon as all entries are in. Thanks for checking in!